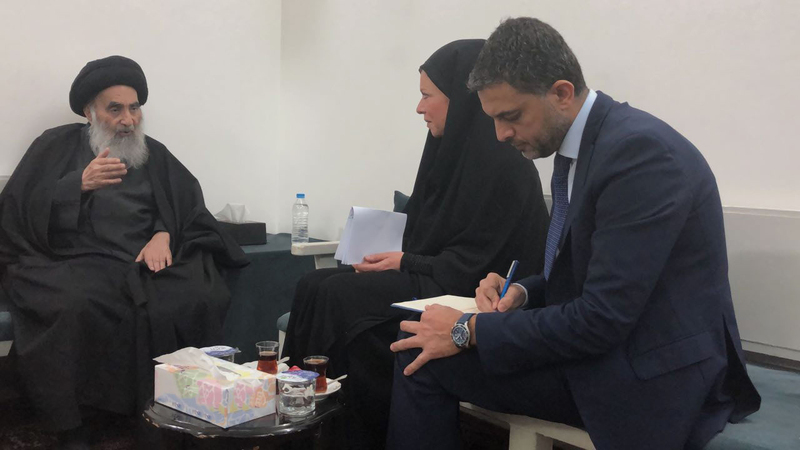 Najaf, Iraq – His Eminence, Grand Ayatullah Sayyid al-Sistani welcomed Ms. Jeanine Hennis-Plasschaert, the Special Representative of the Secretary-General for the United Nations Assistance Mission for Iraq, in his office in Najaf, Iraq, on Wednesday, February 6, 2019. The Iraqis have paid a high price in defeating the terrorism of ISIS, through a large number of martyrs, wounded, disabled, devastated areas of the country, and a huge financial cost. There is an urgent need to reconstruct the war-affected areas and to return displaced citizens after the rehabilitation of their areas. This must be a priority for the government, as it will contribute to reducing the risk of growing extremist ideologies in these regions yet again. Moreover, the international organizations and the international community should help in expediting this mission. The law must be enforced so that it applies to all citizens and residents without any exceptions; where firearms must exclusively be in the hands of the government and it must stand against illegal acts, including assassinations and kidnappings, by holding the perpetrators accountable for their crimes irrespective of their ideology and political affiliations. Both government officials and citizens must abide by what is required to ensure civil peace and community cohesion, to avoid creating divisions between the citizens of the country, and ensure care for the religious and ethnic minorities. Iraq aspires to achieve good and balanced relations with all neighboring countries and other peace-loving governments based on common interests without intrusion in its internal affairs or harm toward its sovereignty and independence. It also refuses to become a station for directing harm toward any other country.